Last week, the American Board of Internal Medicine (ABIM) and the ABIM Foundation released their 990 tax forms. As CEO of both organizations, I’m pleased to report that the audited, consolidated financial statements of the combined organizations reveal that both are in good financial health with net assets of over $31 million as of 6/30/14. In addition to noting the strong financial footing of the organization, Politico also detailed areas where both ABIM and the ABIM Foundation have changed past practices regarding the stewardship of organizational resources. The ABIM Foundation put a condominium that was purchased in 2007 on the market. While the property was revenue neutral (it was used for meetings and hoteling purposes), the decision was made to sell the property last October. I am not reimbursed for spousal travel, and any outside income I earn in terms of honoraria or board service goes directly to ABIM (this also applies to all ABIM staff). All ABIM and ABIM Foundation salaries are reviewed by independent compensation consultants every three years to provide market comparisons in the area of salary and benefits. These changes are not merely symbolic. They demonstrate that this is not the ABIM of 15, 10 or even five years ago. One of the Board of Directors’ and my greatest priorities is to ensure that ABIM makes the best use of the diplomate fees we receive so that ABIM may continue in its mission of enhancing the quality of health care through certifying physicians who demonstrate the knowledge, skills and attitudes essential for excellent patient care in their specialties. ABIM takes its responsibility to physicians, patients and the public seriously, and the Board and I are committed to being good stewards of the resources entrusted to us. 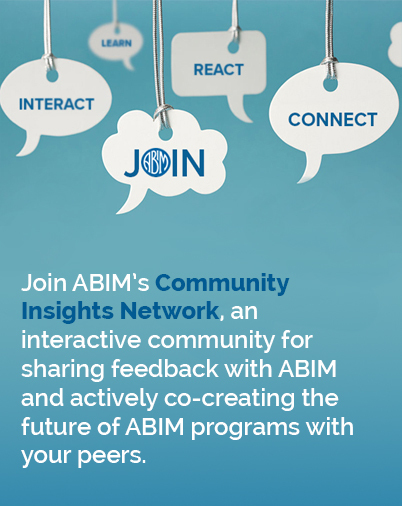 As we move forward, ABIM will continue to listen and design programs that are relevant to the internal medicine community. Throughout this process, we will keep you updated on what we’re hearing and let you know the additional ways you can continue to provide feedback. Please share your thoughts with me directly: rbaronmd@abim.org.